Photo of 85 John Ashton property of Joyce Anderson – Article published by Noosa Today – see link to original article below. 85 John Gilbert Ashton was a 29 year old bricklayer, a native of Lincolnshire England. His mother was Sarah Ashton (nee Hutton), his father, Benjamin was a building contractor, and John was his apprentice. There were opportunities for skilled builders and bricklayers in Australia in the 1900’s, the lure for John may have been good pay for his skill and a new life in Australia. John was with the other sappers as ‘dawn landers’ at Gallipoli and lost his best friend “nugget” and a few good mates on that day. John was active at Gallipoli up to and including the Battle of Lone Pine and the assault on the German officers trench. From the 6th to the 10th August, John spent a few long days and nights with fellow sappers during the ‘Battle of Lone Pine’ and may have been too close to the constant shelling for long periods, or was even a victim of a close call from an exploding shell. This often left survivors shocked and suffering deafness for extended periods of time. John Ashton was suffering from deafness in both ears and his condition never quite improved and while not one hundred percent fit to return to active service in the field, he remained for two years attached to the permanent staff company at Perham Downs England and was promoted to temp. Sergeant. John had fought as an ANZAC and after the war returned to Australia, returned to his trade and married. John and his wife Edith had two children, Joyce and Frederick. John was a member of the 1st FCE Re-Union Association which was established in 1922 by the originals. He was an active and esteemed member and no doubt maintained his friendships with many of the surviving “originals”. Sadly John died in 1954 in his home at Birrong and Edith his loving wife died just four weeks later. ASHTON, Edith Harriet. -June 13, 1954, at hospital, of 28 Stephenson Street, Birrong, adored wife of the late John Gilbert Ashton, loving mother of Joyce and Eric (Fred). Privately cremated 15th June. 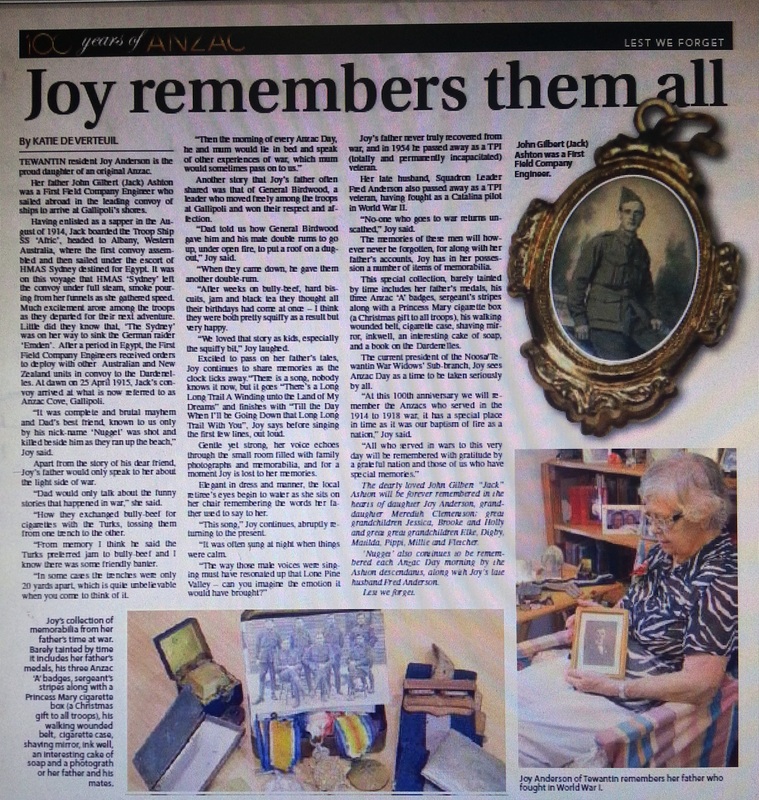 85 John Jack Gilbert Ashton was honoured and remembered on the centenary year by his daughter Joyce Anderson and a tribute in the ‘NoosaToday’ and a story by Katie De Verteuil. The article is available to view and download, please follow the link below and enjoy the story of her brave father. 23 April 2015 7:31 AM . The identity of “nugget” ???? One of the youngest to volunteer was 19 year old 16 Marcus Adamson Clark, another strapping young fellow from country Narandera. He was a blacksmith and farrier and at 5 ft 10” and 12 stone he was one of the youngest and fittest in the company. He also couldn’t wait to get on a horse and get to Sydney as quickly as possible to enlist as he enlisted on the 1st day and was assigned service number 16. Marcus was also a skilled Horseman and was featured in the Sydney Mail in January 1916. Marcus Clark’s story is available and offers some insights into the driver’s of the 1st FCE.